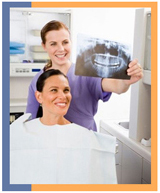 A career in Dental Assisting is an exciting and challenging one. It is a job that is never the same from one day to the next. If you are a people person, enjoy meeting and helping people with their dental health care and making beautiful smiles, then this is the profession for you. Started in 1997, Dental Careers Foundation is the oldest and most experienced dental assisting program of its kind in the Tidewater Area. You will be taught in an actual practicing dental office and learn from dental professionals who practice and teach the most current up-to-date methods. You will not find a better place to learn practical Dental Assisting techniques. Dental Careers Foundation is certified to operate by the State Council of Higher Education for VA (SCHEV). Dental Careers Foundation is an approved school for the MyCAA Program. Military spouses can obtain $4,000 credit on tuition to our school. Dr. John Kordulak is the owner of Dental Careers Foundation.